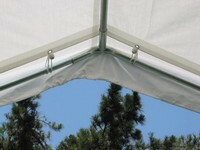 10'X10' Canopy Valance cover fits a 10'X10' high peak(120 degree corner angle) frame. Actual Tarp Cover size is 10' X 12' that extra 2 feet" is needed in order to cover gable angle of high peak (also know as "A" shaped) frame. ."